Although snowbound in winter, Colorado is also famous for its sunny skies. In fact, Pueblo Colorado ties 7th place as the sunniest US city, according to NOAA’s annual average % possible sunshine ranking, with an average of 76%. Only Arizona, California, Nevada, and Texas have sunnier cities. 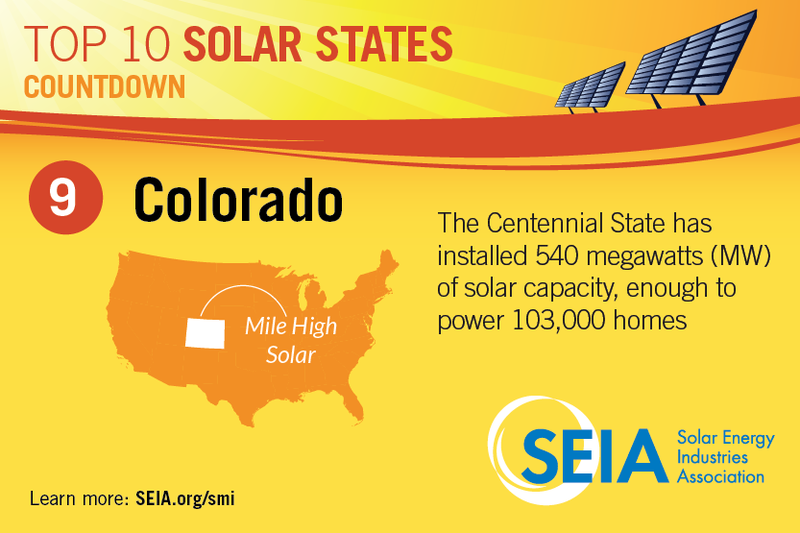 It’s no wonder, then, that Colorado ranks high in the US for installed solar energy capacity. According to the US Solar Energy Industries Association (SEIA), Colorado ranks #9 in its ranking of the top 10 states for total installed solar capacity. Growing 117% over 2014, 146 megawatts (MW) of solar were installed in 2015 alone, making Colorado’s current total 599 MW. At 599 MW, this is enough solar energy installed in Colorado to power 114,000 homes. SEIA projects that, over the next 5 years, Colorado will install another 1,878 MW of solar capacity, more than 5 times the amount of solar installed in Colorado in the last 5 years. 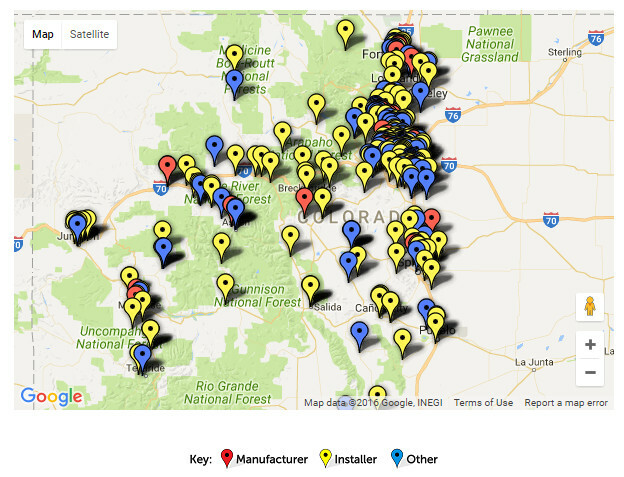 Over 382 companies contribute to the full value chain in Colorado’s solar market, employing nearly 5,000 people. Following solar investments in the state, $305 million was invested in solar installation during 2015, representing a 44% increase over 2014. Significant growth in solar investments in Colorado for 2016 is also expected. Currently, Xcel Energy has around 370 MW of Colorado’s 599 MW solar power on its system, and approximately 230 MW of that comes from rooftop PV systems. This high percentage of power gives Xcel Energy quite an advantage when it comes to driving Colorado’s solar rates and policies. In the past few years, Xcel has been beating the war drums, attempting to persuade Colorado’s Public Utilities Commission (CPUC) to reduce benefits being realized by rooftop solar customers. In August 2015, solar advocates in Colorado believed their latest troubles were finally over when a year-long debate over net metering ended with no rate reductions. But it was clear the fight was not yet over when Xcel introduced a proposed grid-use fee last spring. Arranged on a sliding scale, the proposed fee ranged from $2.62 per month for customers using fewer than 200 kWh per month, to $44.79 for consumption of 1,401 kWh or more per month. It also proposed lowering the customers’ volumetric charge to help offset the fixed cost increase. The SEIA reports that installed solar PV system prices in the US have dropped by 12% from last year and 66% from 2010. In 2016, the latest data indicates that the average installed cost of solar in the US is just below $3.50/watt for residential and $2.00/watt for commercial installations. Of course, everyone’s needs are unique, so it is always best to get a personalized solar quote, but at $3.50/watt, this means that in Colorado it currently costs about $17,500 to buy an average-size (5 kW) system. The federal ITC of 30% will reduce this out-of-pocket cost by about $5,250, and you can expect an additional savings of about $1,224/yr ($102/mo) in estimated energy savings. This total reduction works out to be about $6,474, so the first-year cost of installing a 5 kW solar PV system would be around $11,026. Granted, the monthly energy savings estimate is based on 2011 data, but over the course of 20 years this still works out to be about $24,480, or a net gain of about $12,230 for a 5 kW system installed in 2016. That’s a great return on your investment and we didn’t even calculate the additional gain you might make selling your excess electricity back to the utility under Colorado’s current net metering rate of $0.1243 kWh according to EIA! And what’s more, even if you don’t stay in your home for the full 20 years, the sales value of your home increases significantly from the first moment your solar system is installed. According to a study by the Lawrence Berkeley National Laboratory (LBNL), every kilowatt of solar installed on your roof will increase your home’s sales value by an average of $5,911. A 5 kW system will add $29,555 to your home’s value, so even if you sell after one year, you could potentially pay off your ($11,026) solar system and still make $18,529 on your investment! As an enlightened source of energy in a nation increasingly challenging consumers of solar power, Colorado is blazing a bright path to a clean, renewables future. It’s been blazing this trail since 2004, as the first state to adopt a Renewable Energy Standard. Tirelessly carving a trail through political skirmishes and scuffles, Colorado has served as a solar energy guide to new business models — most recently becoming a pioneer in the shared solar energy market. In January 2016, the Colorado Energy Office (CEO) and GRID Alternatives launched a pilot optimizing the community solar model to reduce energy costs for low-income customers. The pilot proposed five demonstration projects, building a total of 579 kW of shared solar, or community solar gardens (CSGs). CSGs provide access to solar energy generation for renters, people living in multi-family housing, or who are not able to take advantage of solar for any number of other reasons, including roof conditions and shady locations, but especially low income. And, if approved by Colorado’s PUC, VoteSolar’s Rick Gilliam noted, the recent settlement agreement reached this past August will significantly expand solar access across the state, especially among low-income consumers. The new settlement will add to Colorado’s already successful CSG shared solar program in several key ways, including that Xcel will take on a 5% low-income participation requirement and there will also be an incremental 4 MW/year CSG program offering 100% low-income participation. Today, according to Shared Renewables HQ, 14 states and Washington, DC have policies in place for shared renewables and CSGs, and many more states are working to expand access to shared renewable energy resources. The time-of-use (TOU) rate pilot proposes to help Xcel assign an appropriate value for electricity that is produced when it’s most valuable. New voluntary programs will be offered to up to 20,000 customers in 2017. In 2018, it will be extended to 34,000 customers, and to 48,000 customers in 2019. The results of the pilot program will be studied for broad implementation of TOU rates in 2020. More than 24 parties signed on to the agreement, including Colorado Public Utilities Commission staff; the Office of Consumer Counsel; several clean energy, consumer, and environmental groups; Walmart; VoteSolar; and the Colorado Solar Energy Industries Association (COSEIA). The CPUC is expected to make a final decision on the settlement filing by the end of 2016. It is not unanimously supported, and some groups that signed on have requested some changes. For example, Xcel’s proposed Solar*Connect program has been requested to be changed to Renewable*Connect. This program would allow Xcel to build a solar plant up to 50 MW in size and sell shares of the facility to the public. The settlement agreement also changed Xcel’s 2017 Renewable Energy Plan, calling for expanding clean energy resources in a “measured and economically reasonable way.” Adding 225 MW of solar capacity to Xcel’s Solar*Rewards program from 2017–2019, the settlement specifies 123 MW should come from small-scale solar projects. Over the same three-year period, the settlement also requests up to 105 MW of community solar gardens (CSGs) be developed, carving out an additional 12 MW for low-income customers. This adds up to a total of 342 MW of new solar capacity slated for installment in 2017–2019. Limited numbers of low-income solar program participants will be offered solar rooftops, coupled with the Colorado Energy Office’s weatherization program that leverages DOE funding, and Xcel will also provide a $2/W rebate. With a total of 300 participants, the low-income solar program will be offered to 75 participants in 2017, 100 in 2018, and 125 participants in 2019. The following is an in-depth exploration of the state of solar energy in Colorado. Please feel free to offer further contributions in the comments, below. Available within every state of the US, the federal solar investment tax credit (ITC) offers credit from the federal government of up to 30% of a solar installation’s total costs. However, this credit can only be taken full advantage of if you have that much tax liability in the tax year. The current law extends the federal ITC through 2019 and will be phased out after that. Corporate depreciation incentives are also available for business, as well as a Business Energy Investment Tax Credit (ITC-1603), and a Renewable Energy Production Tax Credit (PTC). The following is a limited selection of state solar energy incentives listed for Colorado in the DSIRE Incentives Database. The Database of State Incentives for Renewables & Efficiency (DSIRE) website is operated by the N.C. Clean Energy Technology Center at N.C. State University and offers up-to-date, comprehensive public information on specific solar energy incentives across the US, including state and federal policies, programs, and incentives. • System Capacity Limit: IOU customers: 120% of the customer’s average annual consumption. • Net Excess Generation: Credited to customer’s next bill at retail rate. After 12-month cycle, IOU customers may opt to roll over credit indefinitely or to receive payment at IOU’s average hourly incremental cost. Municipality and co-ops provide annual reconciliation at a rate they deem appropriate. Note: Colorado’s Public Utilities Commission opened a proceeding (14M-0235E) in March 2014 for considering changes to net metering and other issues related to retail renewable distributed generation. However, this docket was closed in August 2015 after the Commission voted to keep the current net metering rules. Eligibility and Availability: Net metering was adopted by the Colorado PUC in December 2005. Utilities must provide net metering service at non-discriminatory rates to customer-generators. Utilities must provide a single bi-directional meter free of charge to customer-generators who do not already own one. A second meter is required for systems over 10 kW to measure output for the counting of renewable energy credits (RECs). Net Excess Generation: Monthly net excess generation (NEG) is applied on a 1-for-1 basis as a kilowatt-hour (kWh) credit to the customer’s next bill. At the end of the year, or upon termination, the NEG must be reimbursed to the customer by the utility at the most recent year’s average hourly incremental cost. Net metering customers may choose to have their NEG carried forward from month-to-month indefinitely, but this one-time only option must be done in writing on or before the end of the calendar year. It’s a pretty bad idea, though, because all kWh credits carried forward will be lost upon terminating service with the utility. Renewable Energy Credits: Customer-generators retain ownership of RECs associated with energy generated by the customer-generator’s system. Utilities may acquire RECs by purchasing them from customer-generators vis a standard offer with a minimum term of 20 years if the system is less than 100 kW. Meter Aggregation: A customer with more than one meter located on contiguous property can choose to have their generator offset the load measured at more than one meter. Aggregating meters under net metering requires that all affected meters must be on the same rate schedule and needs a 30-day notice to the utility, specifying the order in which kWh credits will be applied to the multiple meters. Municipal Utilities and Electric Cooperatives: Colorado law enacted in March 2008 (H.B. 1160) requires all electric coops as well as all municipal utilities with over 5,000 customers to offer net metering for residential systems up to 10 kW and commercial and industrial systems up to 25 kW. NEG follows the same rules as above, receiving 1-for-1 credit in following months, and reimbursed at the end of an annual period. Eligibility and Availability: Colorado enacted the Community Solar Gardens (CSGs) Act in 2010, allowing for the creation of CSGs of up to 2 megawatts in an IOU’s service territory (H.B. 1342). H.B. 15-1377 was enacted in 2015, specifying that CSGs can be located in an electric coop’s service territory and used for complying with the retail distributed generation requirements of Colorado’s Renewable Energy Standard. Net Excess Generation: If a CSG subscriber has a NEG in a monthly billing period, the credit will offset future consumption, rolling over from month-to-month indefinitely until the customer terminates service with the IOU, at which time any remaining billing credits expire. Aggregate Cap: Since 2015, IOUs began acquiring renewable energy from CSGs as part of their renewable portfolio standard compliance plan. Also, a minimum of 5% of an IOU’s purchases from CSGs must be reserved for subscribers in low-income brackets. New voluntary programs will be launched by Xcel Energy for up to 20,000 customers in 2017, 34,000 in 2018, and 48,000 in 2019. These programs will be carefully followed and studied for a broader TOU program to be launched in 2020. According to VoteSolar, customers who opt into the test TOU program will have a 2-month window to cancel if they don’t like it. More hearings are ongoing, but the Colorado PUC anticipates a final decision on this latest settlement by the end of 2016. The adoption and integration of distributed energy storage are making steady progress in Colorado. A panel discussion in April 2015 held by the Colorado Public Utilities Commission (CPUC) investigated a broad range of energy storage topics. Participants delved into such issues as costs, economics, anticipated growth rate, and regulatory changes relevant to energy storage strategies for residential, commercial, and industrial customers. SolarCity’s Ryan Hanley outlined the trending decline in battery prices, and increase in customer interest in utilizing storage systems with solar installations. Hanley described SolarCity as “bullish on energy storage,” and reported that the company anticipates all solar PV installations will include a storage component by 2020. Hanley emphasized to the Commission that policies are needed to recognize the full advantage of distributed storage and allow participants to profit from those advantages. He also pointed out the need for a widespread deployment of smart inverters to ensure the fullest range of benefits from distributed energy storage. Following up on this panel discussion, the CPUC approved Xcel Energy’s request last spring to launch two energy storage demonstration projects. The settlement agreement, signed in March 2016, authorized Xcel to invest $9.1 million for the two projects that will test energy storage applications, one of which will include a microgrid strategy, as well. Known as the Panasonic Project, the first test will feature a utility-scale solar generation plant with one large battery installed by Xcel near Denver International Airport. The Panasonic Project will be connected to the regional grid but will have the capability to operate as a microgrid, as well. Known as the Stapleton Project, the second application will feature 6 batteries installed on the customer side of the meter at homes with rooftop solar already present. Xcel will also install another 6 batteries on that area’s feeder line which receives significant electricity flowing from distributed generation. These batteries will be purposely utilized for storing excess energy to be discharged during peak load hours. • Alamosa Solar Generating Project — completed in 2012 by developer Cogentrix. This concentrating photovoltaics project has the capacity to generate 30 MW of electricity — enough to power over 5,400 Colorado homes. • Hooper Solar Project — At 50 MW, Hooper Solar Project is among the larger solar installations in Colorado. Completed in 2016 by SunPower, this PV project produces enough electric capacity to power over 9,500 homes. • Kohl’s, REI, Safeway, Walmart, and Intel — These are among the larger retailers in Colorado that have gone solar. 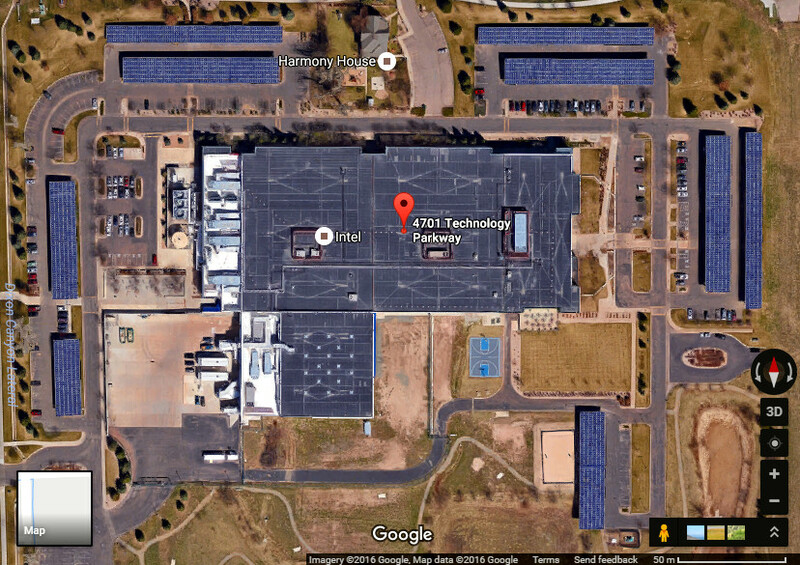 Intel has installed one of the largest corporate photovoltaic systems in the state with 1,000 kW of solar capacity at their location in Fort Collins. Colorado Solar Energy Industries Association – Nonprofit association leading Colorado’s solar industry.